Magic lighting along the LA River on a Brewery Ride of yore. We’re going on another mellow bike ride to sample high quality beer. Join us! This month we’re going to make a little picnic down by the LA River with some growlers we’ll get filled up (before the ride) at Eagle Rock Brewery. Meet at the Flying Pigeon LA bike shop at 6 p.m. on Saturday, October 4, 2014. 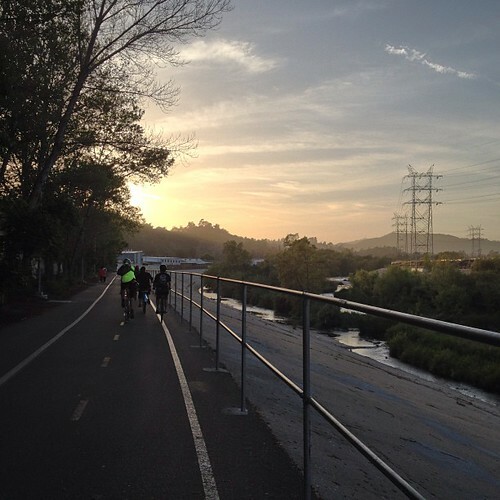 We are going to roll out at 6:30 p.m. on a slow-paced cruise down North Figueroa, across the miserable new Riverside Drive bridge, and onto the pleasant LA River Bike Path to a local park. Plan to be back at the Flying Pigeon LA bike shop at around 8:30p.m.